This set of RAF personnel was primarily produced to 'decorate' and enliven models of aircraft, and after years of producing such aircraft it was long overdue. However there are a number of interesting and unusual poses, which mean these figures will make an interesting diorama in their own right. 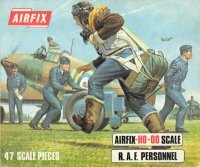 There are fewer figures in this set than in most other Airfix offerings, but with 19 poses there is a lot of interest. The usual mechanics performing their various maintenance and rearming roles include some handling machine-guns, ammunition and even a camera. The important role of women in this service is recognised with an aircraftwoman handling a gun and a WAAF officer. Another officer and two airmen, one of whom is running for his plane, complete the good range of poses. At the start of the war RAF uniform was 'Service Dress', a smart tunic with open collar revealing a shirt and tie, but only one pilot and the cyclist are wearing this. From 1940 a blue-grey version of the army's battledress began to be issued, called 'Suits, Aircrew', and later 'War Service Dress', which was to become standard dress. The ground crew are all wearing this uniform - still with shirt and tie - and all wear the normal field service cap, which suggests they are not working while under danger of attack. The trousers of this uniform all have the large thigh pockets that mark it out as being mainly appropriate for the period up to 1943, when a simpler version was issued. However we felt that these trousers were sculpted rather tighter than they should be. The WAAF technician wears a uniform very similar to that of the men, but sports a peaked cap. The WAAF officer wears service dress with a plain, straight unpleated skirt. The running pilot wears an Irvin suit and life jacket, but strangely no goggles nor oxygen mask. His parachute is of the seat-type variety, which was used by pilots of single-seater aircraft. All these various uniforms and kit are correctly sculpted and realised with very good detail. Those RAF personnel in the real front line were the pilots and air crew, and it is a shame that more of these are not represented here. However as additions to aircraft kits it is to be expected that the emphasis would be on ground crew. The figures have been very nicely done and well researched. The female figures are a lot more slender than the male, which sounds reasonable but has probably been a little over done here. It would have been nice for some figures to have been in overalls, and for some to be wearing helmets. Some of the figures, particularly the cyclist, do suffer from flash, but in general this is a well executed set which shows a lot of imagination.